We made a short video of our experience here! Check it out on YouTube or at the bottom of the post. The Blue Lagoon in Nusa Ceningan lives up to its name. The waters here are the bluest we have ever seen in all our travels. Once a popular cliff jumping spot, the cliff jump was "officially" closed after a serious accident. However, you will still find many cliff jumpers here taking on the 8m and 13m jumps. If you choose to jump make sure to check the tides and swell beforehand and only jump if the waves aren't too large. To get out of the water you'll need to climb up some sharp rocks so bring water shoes if you have them! The Blue Lagoon area is open at all times. If you are more interested in taking photos at the front of the lagoon, you can go at any time, although it'll be less crowded the earlier you go. For cliff jumping, go at high tide and when the swell is small. Entry, parking, and jumping are all free. Blue Lagoon is located on Nusa Ceningan. It's an 8 minute drive from Yellow Bridge and right around the corner from Mahana Point. Since Nusa Lembongan and Nusa Ceningan are both small and have fairly nice roads, we recommend renting a scooter to explore these islands. There are also drivers and tours available but expect to pay much more for these. The first time we visited Blue Lagoon we spent a few hours exploring the lagoon and surrounding cliffs, admiring the stunning water. We then made our way to the cliff jumping spot at the entrance of the lagoon. Staring down the platform of the 13m jump is truly scary. We had heard that there were several severe accidents here and since no one else was jumping in, we were nervous about trying it on our own. It was only as we were leaving that we saw two guys do the smaller 8m jump. After that, we were determined to return to jump when we were feeling more brave. The next visit we decided to warm up for the Blue Lagoon jump by hitting the neighboring Mahana Point cliff jump first. A local restaurant runs this spot and they have jumps of 5m and 10m. At Mahana Point, there's a ladder to help you get out of the water and the staff tells you if it is currently a good time to jump based on the sea conditions, making it safer than Blue Lagoon. After doing the 10 meter jump there, we were feeling more confident and decided to scope out the Blue Lagoon jump one more time. This time, there were several other groups of people cliff jumping here. The tide was high, the waves were very small, and even a few 10 year-old boys were doing the jump, so we were easily convinced to dive in. The water is quite deep so we weren't worried about hitting the bottom, but as always make sure to assess the situation yourself before you jump! We spent the whole afternoon here jumping and watching other jumpers. This might be one of the most beautiful cliff diving spots we'll ever see, so we were very glad that we returned to do the jump after all. 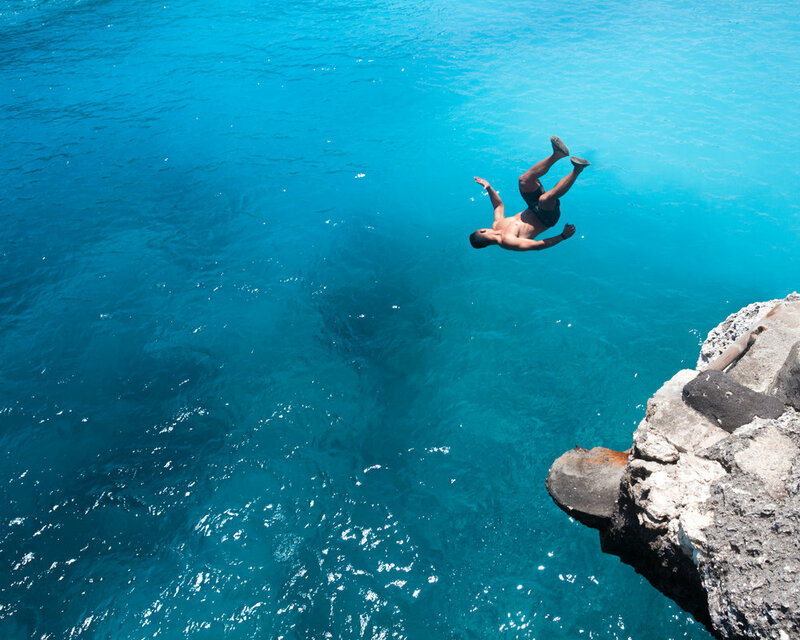 Be sure to check out our video on cliff jumping in Nusa Ceningan!